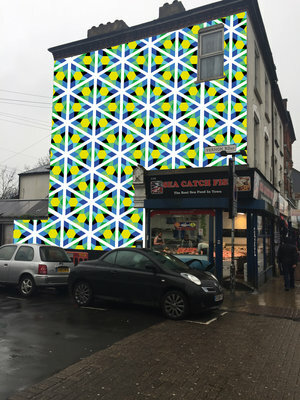 Wood Street Walls, supported by Amal – A Said Foundation Project - has has commissioned Zarah Hussain in collaboration with Wood Street Walls to paint her first outdoor mural of 2017, asking the public to choose between four different artworks inspired by Islamic geometry and patterns - the winning design will be painted on the wall on the corner of Walthamstow Market & Vernon Road in the month of June as part of Ramadan and Eid celebrations. East London urban arts collective, Wood Street Walls have collaborated with Walthamstow based and internationally recognised artist Zarah Hussain to participate in this year's Pick Your Pattern project, in partnership with Amal, an initiative that supports Muslim cultures and arts in the UK, including storytelling, visual arts, theatre, poetry, music, dance and film. 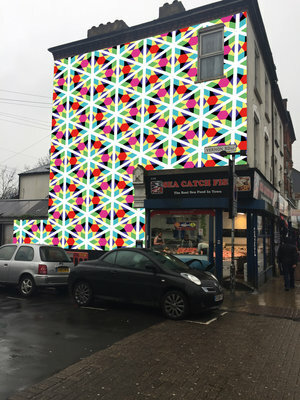 Pick Your Pattern 2017 will be promoted throughout London and the public is encouraged to vote on one of the four designs created by Zarah Hussain. Every individual that votes will be entered into a prize draw to win £100 shopping credit at The Mall. People will be able to vote online via the Pick Your Pattern website, or vote in person by downloading the form or completing a Pick Your Pattern Postcard which will be delivered to thousands of households in Walthamstow and the surrounding areas with the support of Local Estate Agent Stow Brothers. Completed forms can be delivered to a drop off point located in The Mall, Walthamstow. The work of Zarah Hussain is at the intersection between science and spirituality, combining contemporary digital art with a rigorous training in traditional Islamic geometry drawn by hand. Her work encompasses a range of forms, from looping infinite animations made with code, to sculpture, painting and interactive apps. Her work uses mathematics that celebrate the order and structure found in the universe to create a range of work based on infinite repeating patterns. 2. To provide free periodic workshops for the charities, school children and beyond - to build a connection between the artistic and local community and help develop grow new talent for the next generation of artists. 3. Our final and biggest goal of our project is the establishing of a new creative hub for the area: Wood Street Studios, by repurposing a disused and derelict building in the area. According to a study commissioned by the Mayor of London, in 5 years over 30% of the current 14,000 artists in London will no longer have a place to call their own due to rising rents and land being developed by residential housing. 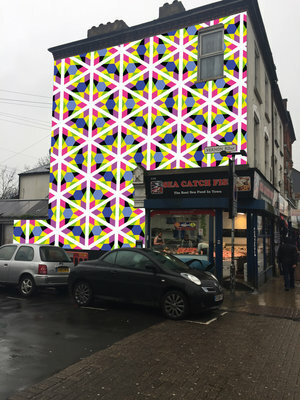 Paint Leyton aims to raise money to help deliver more murals in London (Leyton?) via the Co-Op Local Community Fund, asking members to donate their 1% through their Co-Op memberships. Watch a 160 meter long mural in Walthamstow come to life by artist Saskia Pomeroy in collaboration with Wood Street Walls. GLA funding award to East London arts group for first new wave of legal art walls in London.